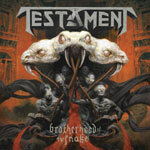 Testament has basically returned to a faster and a little more brutal environment again. Just to make a comparison, this new record's sound is most similar to what the band made on The Gathering  and you could probably also say that they've taken the faster and heavier material on the last record, Dark Roots Of Earth , and developed it into a new monster for this record. If you would put some effort to listen to details, you will rather frequently, in the vocal melodies and the guitar play, recognize stuff from the band's early material from the late 80's as well. The production of records is obviously totally different today, but if you peel off the self-evident fact that exactly everything sounds clearer, more voluminous and more powerful, you can easily hear the inner soul of Testament in pretty much all of the songs. Even if the sound is quite a bit away from state of the art, quality-wise, I definitely like the overall massive and heavy appearance since it suits these type of songs perfectly in my ears. The band has decided to exclude ballads completely this time and Brotherhood Of The Snake actually comprises only one real mid-tempo song, Born In A Rut, and therefore they have made plenty of room for a solid thrash metal impact. The riffing from Eric Peterson is of course heavy and the drum play is nothing but enormous and the latter can hardly come as a surprise with master drummer Gene Hoglan on the stool. The vocal performance of Chuck Billy lands at a kind of normal level with partly aggressive song, yet with only a few really ferocious outbursts over the record. Even his tone of voice is, what I would say, most normal and sometimes I become somewhat impressed by the way that he is able to come out with things that could have come from any record in the group's almost 30 year long career. Most of this record's content is exciting and if you like the band before, you should surely like what they now present too. Testament never cease to amaze and is really one of the few thrash metal bands out there that's still able to write great music and as far as I'm concerned it's certainly even now on par with the old and classic material.